Using a Chemex is a fantastic brew method, but due to the uniqueness of it, it can be rather tricky to clean. That’s why today I’m going to show you how to clean a Chemex step-by-step. The truth is, the cool beaker-like design is great to look at, but it can be hard to access the inner workings to scrub them. Making sure that all of your previous batch of coffee is removed is just the first step in completely cleansing your Chemex. Keeping your Chemex coffee brewer clean will ensure it has a long life making great-tasting coffee. 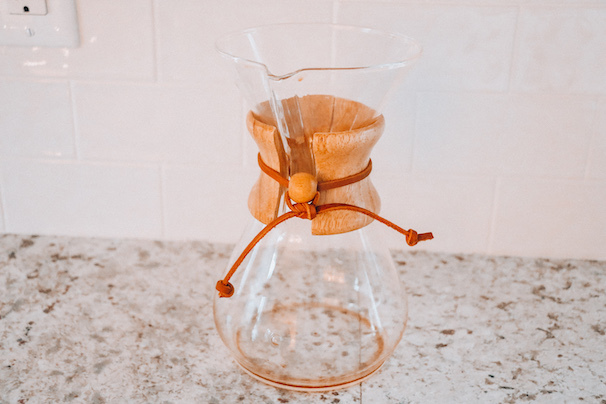 We’ve put together this short guide to let you in on a few must-know tricks and tips for when it’s time to clean your Chemex. The number one way to avoid a build-up of bacteria in your Chemex is by thoroughly cleaning after each and every use. One of the most effective, and arguably the simplest, methods of cleaning your Chemex is with soap, water, and a brush. Ideally, you want to use a brush with soft bristles and an arm long enough to allow you to scrub the internal walls and corners. After scrubbing it’s essential to rinse thoroughly to avoid the risk of any soapy flavors contaminating your next batch. While less meticulous than the method outlined above this technique still cleans your Chemex, it just doesn’t sanitize it. Simply boil some water, pour it into the Chemex, and swirl it around for a minute or two. This hot rinse will flush out all of the old coffee and prevent your next batch from having its taste altered or impaired by the last batch. For that simple purpose, the hot rinse technique is more than enough. 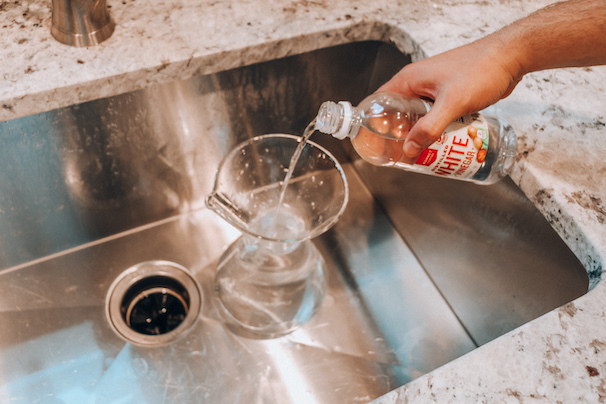 For this method, you will require a full pint of ice, around two tablespoons of table salt, two or three drops of liquid dish soap, and water. The first step is to make sure that there is no residual coffee left in your Chemex. Then pour in the ice, salt, and liquid dish soap and mix it all up. Next, you’ll want to fill up Chemex with water, about a third of the way full should be enough. Once you start to swirl you should see a froth start to develop. 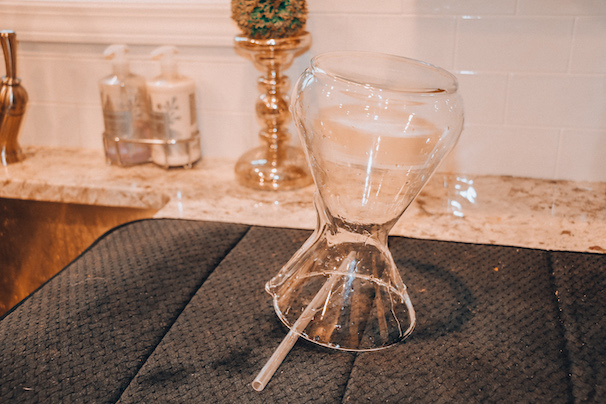 The swirling ice applies the right amount of force to scrub the coffee oils and residue off the glass, without risking scuffing it, and the table salt acts as a mild abrasive to help get rid of any coffee stains and mineral residue from the water. 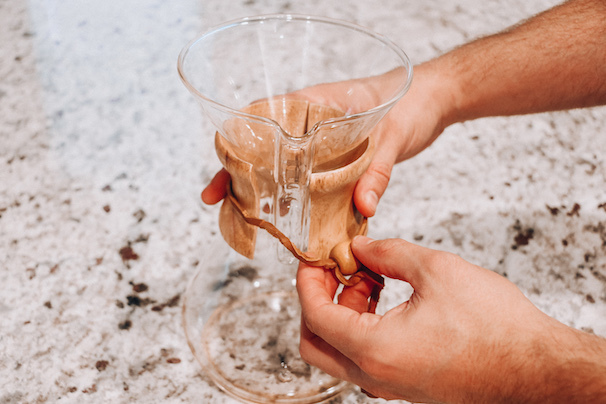 If your Chemex is really in need of a deep cleaning, you will want to swirl for a minute or two longer. Many Chemex users find a white vinegar solution to be easy, effective, and economical means of cleaning. For this method, you will need to pour around 2 ounces more than your average batch of coffee of white vinegar into your Chemex and let it soak. After approximately thirty minutes to one hour rinse it thoroughly with soap and water, or just water if you prefer, and leave it to dry. It’s recommended that you leave it out to dry overnight in a well-ventilated area so that the vinegar taste and smell will naturally air out. When doing this, it is important that you rest part of the lip of your Chemex on an object. This is because if the lip is completely flat, there will be no air flow and it will cause condensation and in the worst case, molding. Be sure to prop up one side of your Chemex to avoid this happening. 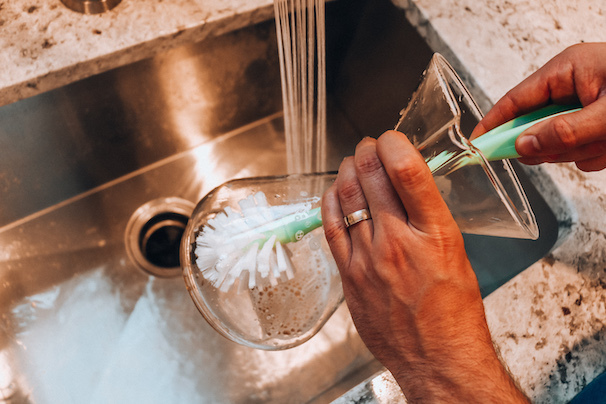 Use A Dishwasher – If It’s Safe To Do So! The majority of Chemex are dishwasher safe. So, if you check your and the manufacturer has approved the use of a dishwasher, then go right ahead. Being cleaned in a dishwasher can leave your Chemex looking immaculate, but it’s important to be extremely cautious due to the delicate body of the Chemex. If you do decide that you want to wash your Chemex in the dishwasher, you should definitely remove the collar and tie before loading it in. So, there you have it. Now you know a variety of ways to keep your Chemex clean, you’ll be able to treat your taste buds to the best quality coffee that it deserves. Remember, there’s nothing quite like the taste of coffee that’s been brewed in a Chemex. Coffee, in its simplest form, is just water mixed with ground coffee beans. There is much more to it than that, though. There is a myriad of factors that affect how good it will taste. If you want a complex, balanced, sweet, aromatic, sour, or bitter flavor then there are two things that you need to be aware of. The quality of the coffee beans and the water, and how exactly you choose to mix them. The last factor is undeniably the most important, and it can get pretty intricate pretty fast: the grind size, brew time, water temperature, and the brewing device, are just some of the things that will impact on the quality of the final cup. Arguably, the most important factor is the brew ratio. This is the ratio of ground coffee to water and is what will affect your drink’s strength and mouthfeel, amongst other things. Approximates will not lend to a consistently good final brew. Using coffee to water ratios for any brewing method will allow you to have a target final weight and a constant extraction for every coffee, resulting in a taste that you will begin to know and love. So, let’s take a look at the importance of brew ratio and its significance in making a great cup of coffee. Why is The Coffee to Water Ratio So Important? A coffee’s flavor will vary depending on the technique used to make it. Think of it as you would any other recipe, it is a delicate art and the amount of each ingredient that you use matters. By increasing or decreasing the amount of water or coffee beans that you use, you can alter the taste and the viscosity of the beverage. This is why baristas and coffee aficionados alike often use scales and timers when brewing. Some baristas swear by recipes such as “60 grams of coffee per liter of water for so many cups.” But others will instead focus on ratios. Understanding these ratios is simple. If you have 1g of coffee and 1g of water, the ratio of coffee to water is 1:1. If you have 1g of coffee and 15g of water, the ratio is 1:15. But nobody brews a 15g cup of coffee, that is way too small for the much-needed caffeine hit. What is more common is a 300g cup of coffee. No matter the brew ratio, most baristas will aim to keep it consistent. This is so that they can work effectively and efficiently, but also so that if they like how a coffee tastes, they can easily replicate it in the future. If you do not have a gram scale, a good rule of thumb is that 1 tablespoon equals approximately 7 grams. In addition to pre-weighing your coffee, you should weigh your water in real time when possible so that you are sure your measurements are 100% accurate. For manual brews, weigh the water while pouring from a kettle. For automatic drip, weigh the water before you pour it into the brewing reservoir. If you have a high-quality coffee that has been masterfully roasted in order to emphasize its best characteristics then you will want to brew it in the correct way so that you can enjoy all of its nuances. For many people, filter coffees are the perfect way to enjoy all of the variety that your coffee has to offer. The flavors are clean and it is a more diluted drink. The opposite of this would be an espresso, a more intense beverage that is only capable of displaying two or three main flavors but does it wonderfully. With these different styles of coffee comes a different ideal brew ratio, grind size, and extraction time. For espresso, you will generally be using an extremely fine ground coffee bean as well as a short brew time – generally around 25 to 30 seconds, and very little water. An ideal ratio would be between 1:1 and 1:3. There are shorter and longer variations of the espresso, the Ristretto, and lungo, where the recipe varies slightly. The rule of thumb for immersion coffee is a coarser grind and a longer brew time. Immersion and drip will require a lot more water, and obviously, a lot more coffee. You will often hear that the best ratios of coffee beans to water are somewhere between 1:15 and 1:18. However, this is not always the case, when one talks about good ratios, it is generally in terms of what is accepted as preferable. Is There an Ideal Coffee to Water Ratio? Well, not really. It all comes down to personal preference. Around the world, different cultures prefer different types of coffee, some prefer subtle, delicate brews, and some prefer intense, flavorsome ones. While many people will recommend different ratios that they swear by, it always depends on the coffee bean and personal preference. It is important to know what brew ratio to use for what kind of coffee that you are making. A filter coffee at 1:20 would be unpleasantly weak, and at 1:10 would be too intense for most people’s palates. Those are obviously the extreme ends of the scale and your aim should be finding the right balance for each individual bean. You will want to be able to perceive all of the individual nuances that led you to purchase that been in the first place. The fragrances, aromas, and flavors will all be accessible to you, should you get your brewing ratio right. For some people, bypassing the brew altogether is the ideal means of bringing out all the subtle characteristics. They will brew their coffee with a fairly small amount of water to get the intensity, and then to avoid the heavy mouthfeel, they will proceed to dilute it with water, this is an uncommon technique, but those who practice it, swear by it. So, now you know what you know, you should be well on your way to making the perfect coffee. It is not always easy because there are so many variables to take into consideration. But when you master it, oh boy, is it worth it! You’ll be able to appreciate all of those subtle notes that are written on your packet of coffee just like a professional barista would.